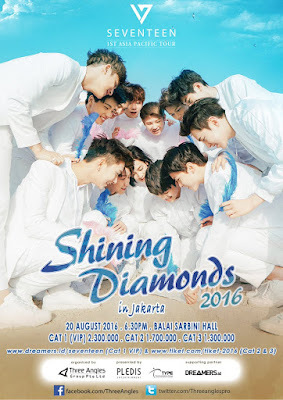 Event: Seventeen 1st Asia Pacific Tour – Shining Diamonds 2016 in Jakarta. All ticket categories will be available from June 5 from 12pm. 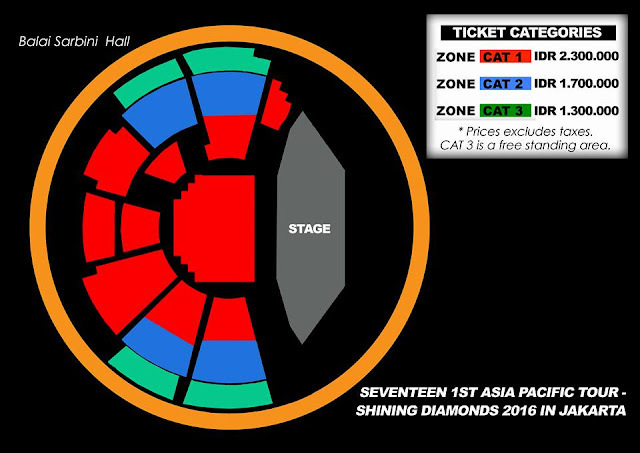 Can we select the seats for purchase for Cat 1 to Cat 2? Yes, you can select your preferred available seats. However, you have a 10 minute to make your purchase. Will there be an extension stage or catwalk for the event? No, there will not be any extension stage. Will there be a Mosh Pit for the event? Only Cat 3 is free standing. The other categories are seated. Will there be Official Seventeen merchandise on sale at the event? This will be announced at a later date. Videography and photography is strictly not permitted during the event. Is the High Touch/Photo Op pass transferable? The High Touch and Photo Op pass is strictly not transferable and NOT for sale. Can I apply for a media pass for the fan meet? Only personnel representing an official media platform may apply with us. Freelance photographers, bloggers, fan groups or unrelated media will be rejected. Successful applicants will receive our email reply for media registration. We seek the patience, understanding and cooperation from all fans to ensure a smooth and memorable event. We do wish to remind all fans to purchase tickets through official platforms and not from resale online means to avoid disappointment or being cheated. Follow us on FB & Twitter for the latest updates and news.